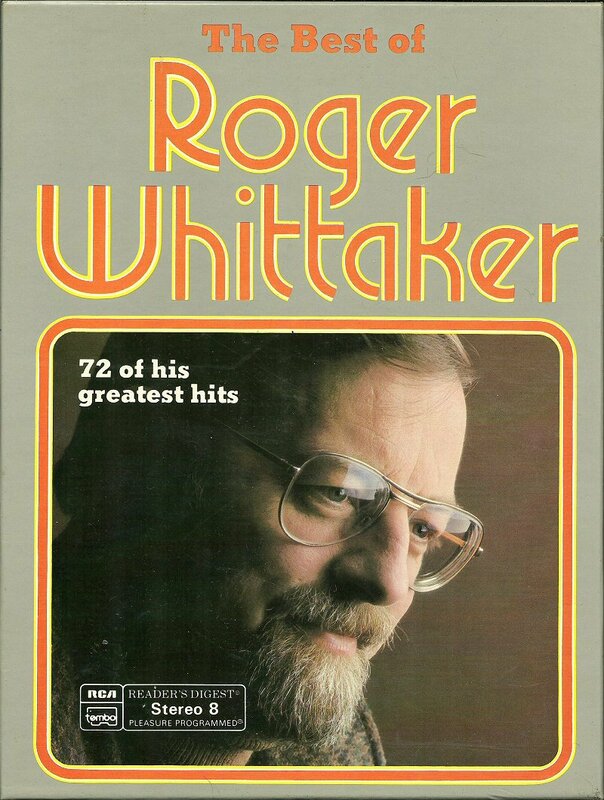 This 3 8-Track Tape Box Set features 72 of Roger Whittaker's Greatest Hits. It's from Reader's Digest music. Tapes are in Factory Sealed, Never Played Condition. You get all the hits: Durham Town, New World in the Morning, The Last Farwell, I Don't Believe in If Anymore, Mexican Whistler and many others. (See the complete track listing below). Plus some great cover song of popular hits, made new by Roger Whittaker's unique soft and gentle vocalization... song like: Morning has Broken, All I Have to do is Dream, Those Were the Days, 500 Miles from Home and Scarborough Fair. All these great songs in one Factory Sealed box set collection. We've seen this set available, used, elsewhere on the Web for over $35 + Shipping. If you're an 8-track collector (or active listener), pick up this very rare, hard to find, set now for a bargain price! NOTE: This is an 8-Track Tape collection; not CD or Cassette. CONDITION: Tapes are still Factory Sealed. Mint. Never Opened, Never Played. NOTE: Comes in a display box that is opened but in very good shape, just some minor scruff. There is no booklet with this set, but track titles are listed on box cover and on each 8-Track tape. Tapes are still sealed in shrink wrap. TO PURCHASE: Just click on the BUY NOW button above to add this unique and hard-to-find collection to your shopping cart. Google Wallet is eCrater's default, but if you prefer to use Paypal, USPS money order or US personal check just choose Alternative Payment, fill in the initial information and proceed to your payment choice. You can cancel any time before confirming your payment. - If an item is listed as ON HOLD, it means it's out of stock. Please email us and we can let you know if we expect to list it again. Thanks for visiting your Old Friends. Be sure to check out our store for other great Reader's Digest CD packages like this one.